The 1917 poster reproduced below, from the photograph published in This Fabulous Century: Sixty Years of American Life, vol. 2, 1910-1920 (New York: Time-Life Books, 1969), p. 234, illustrates the domestic intelligence-gathering efforts of the American government's "Committee on Public Information" during the First World War. Although it would have people believe that German spies were everywhere, this threat was greatly exaggerated. 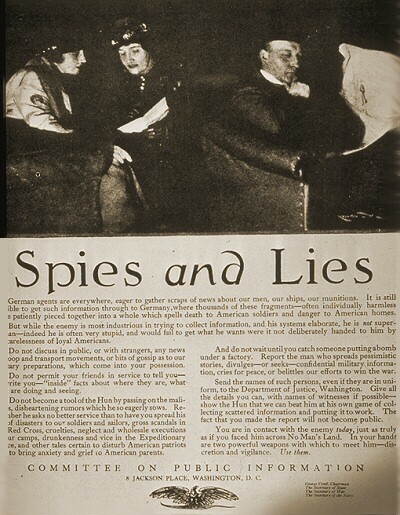 Posters like this encouraged Americans to spy upon one another, to be "vigilant" against those who criticized American involvement in the war. Citizens were urged to inform the Department of Justice if anyone "spreads pessimistic stories ... cries for peace, or belittles our efforts to win the war." The U.S. Congress had passed war-time sedition laws that established heavy penalties for people who criticized the government and its war policies. German agents are everywhere, eager to gather scraps of news about our men, our ships, our munitions. It is still possible to get such information through to Germany, where thousands of these fragments—often individually harmless—are patiently pieced together into a whole which spells death to American soldiers and danger to American homes. But while the enemy is most industrious in trying to collect information, and his systems elaborate, he is not superhuman—indeed he is often very stupid, and would fail to get what he wants were it not deliberately handed to him by the carelessness of loyal Americans. Do not discuss in public, or with strangers, any news of troop and transport movements, or bits of gossip as to our military preparations, which come into your possession. Do not permit your friends in service to tell you—or write you—"inside" facts about where they are, what they are doing and seeing. Do not become a tool of the Hun by passing on the malicious, disheartening rumors which he so eagerly sows. Remember he asks no better service than to have you spread his lies of disasters to our soldiers and sailors, gross scandals in the Red Cross, cruelties, neglect and wholesale executions in our camps, drunkenness and vice in the Expeditionary Force, and other tales certain to disturb American patriots and to bring anxiety and grief to American parents. And do not wait until you catch someone putting a bomb under a factory. Report the man who spreads pessimistic stories, divulges—or seeks—confidential military information, cries for peace, or belittles our efforts to win the war. Send the names of such persons, even if they are in uniform, to the Department of Justice, Washington. Give all the details you can, with names of witnesses if possible—show the Hun that we can beat him at his own game of collecting scattered information and putting it to work. The fact that you made the report will not become public. You are in contact with the enemy today, just as truly as if you faced him across No Man's Land. In your hands are two powerful weapons with which to meet him—discretion and vigilance. Use them. 8 Jackson Place, Washington, D.C.